Ersatz, from Paris Stalker, is a rhythm-based platformer with an electronic soundtrack, featuring house, trance, synthwave, DnB, and techno music, and each level has a BPM count. Enemies move and attack along with the beat - adding to the soundtrack with sounds of their own - and players can use the timing to dodge projectiles and predict the movement of objects in the environment. 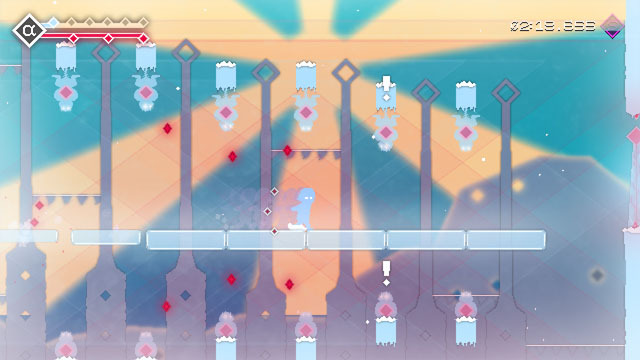 Much of the gameplay centers around the player's ability to dash, and he can only dash three times before he runs out of energy, unless he kills an enemy during the dash, in which case he can dash again, setting up scenarios where players can dash quickly through the level by stringing together attacks. The game is tough for first timers and relies on learning and repeating levels to get higher rankings. The game is now available for PC via Steam and Itch.io. Check our coverage here.